What better way to start mid-term week than with a 90-minute Brewing Calculations mid-term at 8:30 am on a Monday. …followed by a one-hour lecture on predicting residual alkalinity and pH of the mash. So here’s the thing. Water hardness–the amount of calcium and magnesium in the water–is desirable. Water softness or alkalinity (an overabundance of free CO32- ions, aka carbonates) is not, since it will not only raise the pH of the mash, but also acts as a pH buffer, resisting the efforts of the brewer to lower the pH. Since low pH is good for enzymes, good for yeast, limits extraction of phenols from malt husks, improves the quality of hop bitterness, improves filterability of the mash, and improves coagulation of proteins in the kettle, a low pH is very desirable. Being able to predict when our mash pH is going to be too high before we even start brewing is better than discovering that our mash pH is too high in mid-brew and trying to correct it after the fact. Both hardness and alkalinity can be characterized by the presence of calcium carbonate (CaCO3), since it contains both hardness in the form of calcium (Ca2+) and alkalinity in the form of carbonate (CO32-). So if we take all the calcium and magnesium ions in brewing water and convert them to equivalent amounts of CaCO3, and then take all the carbonates and bicarbonates present and also express them as an equivalent amount of CaCO3, we will then be able to see what the total hardness and alkalinity of the water is as expressed by the presence of CaCO3, calculate how this will affect our mash pH, and then make suitable adjustments to the brewing water. The next step is to convert this value to an equivalent amount of CaCO3 in parts per million, which is done by multiplying the mEq by the molecular weight of CaCO3 (which happens to be 50). Therefore, 2.45 mEq x 50 = an equivalent value of 122.5 ppm of CaCO3 in the local water. So what, you say? We’re not done yet, I reply. A German researcher discovered that 3.5 equivalents of calcium or 7 equivalents of magnesium would offset the pH raising effects of 1 equivalent of carbonate. Therefore, if we simply subtract the equivalent of calcium (divided by 3.5) and the equivalent of magnesium (divided by 7) from the carbonate equivalent, we can see how much Residual Alkalinity is left in the water–that amount of alkalinity that will resist any attempted lowering of pH. If we then convert this back into CaCO3 (1.12 mEq x equivalent weight of 50), we get a Residual Alkalinity of 55.95 ppm. This is right on the edge of being too alkaline for brewing. Alas, my brain had melted by this time, so my notes are meaningless scribbles highlighted by phrases like “acidulated malts” and “acid additions”. Some day this will all make sense. As if this wasn’t enough for one day, it was also the first day of class presentations in History of Beer. Yours truly was the third presenter, speaking for 12 minutes on Russian Imperial Stout: Being a moft excellent and entertaining Recital of the Hiftory of the Exportation of Strong Beers from London to Russia with divers scholarly Addenda and learned Afides by the Author. This was actually a very educational topic from my point of view. I had previously understood that Russian Imperial Stout was so named because it was made by English brewers for the court of Catherine the Great, and that it was stronger and hoppier than normal so that it wouldn’t freeze as it was being shipped across the icy Baltic Sea. What I discovered was that trade in strong porter had started six decades before Catherine the Great, during the reign of Tsar Peter (also “the Great”), who discovered English beer on a trip to London in 1698. He liked dark London porter so much that, during his visit, he became a prodigious party animal who had to be wheeled back to his lodgings in a wheelbarrow each night. Upon his return to Russia, he ordered a shipload of the stuff to be sent to his new court at St. Petersburg. Alas, the 4-month voyage proved too much for the low-gravity English beer, and brewers were forced to increase the bitterness and strength not so that it wouldn’t freeze, but so that it would arrive in Russia in a drinkable state. The export of strong stout continued for the next 300 years, until the First World War and the Russian Revolution put an end to the beer export market. However, the name “Russian Imperial Stout” actually wasn’t given to the stuff until 1934–twenty years afterwards–as a marketing gimmick to attract English drinkers. But wait! There was more. Bill White then gave a one-hour lecture on technology and its effect on beer, from the water canal and the steam engine to the microscope. Chronologically, 2/3 of the way to the finish line. Next week marks the midway point of the first semester, so teachers have started to roll out the mid-term exams, starting with Business Ethics this morning. More sampling! 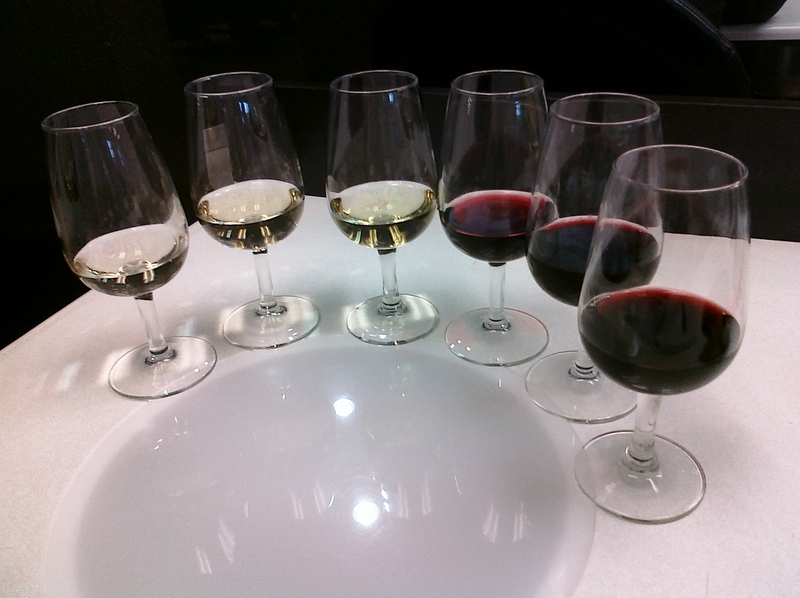 From L to R: Sauvignon Blanc, Chardonnay, Gewurtztraminer, Beaujolais, Shiraz, Cabernet Sauvignon. My new factoid for the day was that “aroma” and “bouquet” are two different things. Aroma refers to the up-front primary smells provided by the grapes. Bouquet is the combination of secondary and tertiary smells provided by the method of preparation–oak-aging, for instance–and terroir. Alas, wine is no beer, but the subtle differences from wine to wine are interesting, if somewhat limited in scope. But no time to waste contemplating differences ebtween wine and beer. I’ve got an on-line test due this Friday, two mid-terms next week and a major class presentation to prepare. No time to even have a beer. Okay, I’m lying about the last part. Canadians had Monday off for Thanksgiving, so I started the week with History of Rock & Roll. Today it was the interregnum between the death of Buddy Holly in 1959 and the British Invasion of 1964. Not much springs to mind musically–in American Grafitti, set in 1962, the “aging gunslinger” John (played by Paul Le Mat) wonders what happened to the good music. However, this was actually the time when surf music made its mark, Phil Spector developed his “Wall of Sound” studio technique and Motown Records got going. So a veritable explosion of genres coming down the pipes that would hit the fan in 1964. Next week, the Beatles. I’m something of a Beatles fan–it’s the first pop music I can remember listening to–so I’m looking forward to the next couple of classes. Maybe I should bring in Beatles Rockband for the class to play during coffee break. On to FCF, where we cleaned up the last bit of info on filters, namely membrane filtration. Membrane filters use sheets of weird plastics that due to their molecular structure, have very small pores of uniform size. Unlike depth filters, which can only be given a nominal rating — “we think it will filter particles this size”–membrane filters can be given an absolute size of particle they will filter out. They are washable and resistant to caustic and acid, but they ain’t perfect — they can only be used on beer that has already been coarsely filtered, otherwise the membrane filter will quickly get clogged with yeast and then blow a gasket. Brew day! After three weeks, it was finally time for Team A’s return to the Teaching Brewery. Alas, the two of us from Subteam A1 who had brewed up our Vice Populi hefeweizen last time were relegated to non-brewing chores, which would include packaging the Vice Populi. No, this is not a Dalek, but backwashing the filter with scalding water does produce enough steam for an episode of Dr. Who. Before we could get to that, first we had to filter 1100 litres of beer while transferring it from Moe (one of the large fermenters) to Shemp (the bright beer tank). 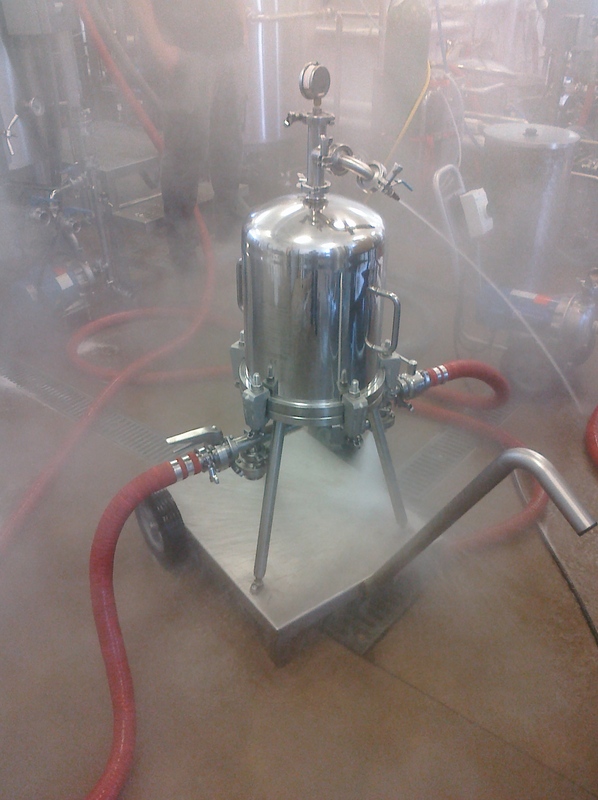 Once that was finished and the filter backwashed and cleaned, we then cleaned Moe and prepared him to receive another batch of beer. Speaking of sci-fi, this is The Thing from The Grundy Tank. Note the 2″ hose required to handle the blow-off. One thing that constantly amused us through the day was watching the fermentation action of the 1st-year students’ graduation beer. They had come up with the concept of an Imperial stout that they would barrel-age until their graduation in 18 months. So yesterday they brewed up an enormous batch of wort, complete with 35 kilos (80 lbs) of Belgian candi sugar — yes, 35 kilos! — then transferred the wort into our old Grundy fermenter. 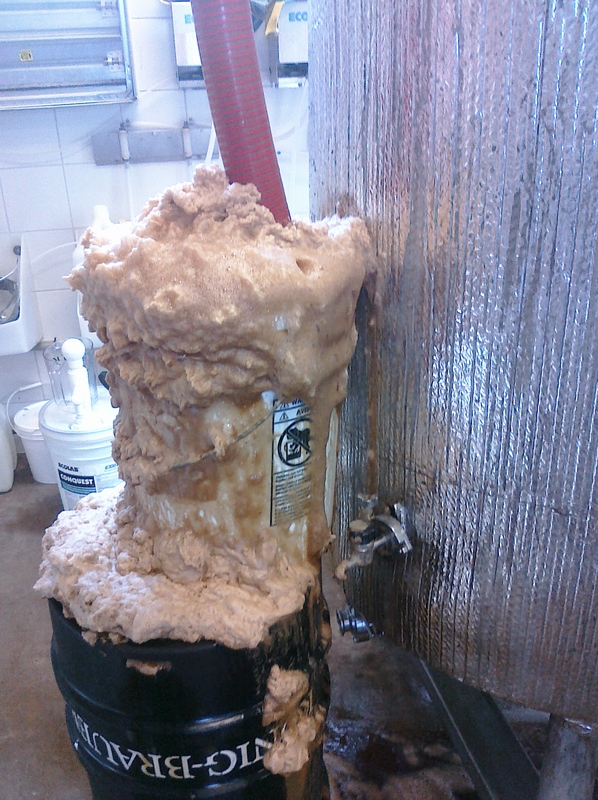 With all that sugar, the yeast went into overdrive, producing prodigious amounts of CO2–apparently too much CO2 for the usual blow-off tube, since sometime last night, the pressure of the CO2 removed the blow-off tube with enough force to leave splash marks on the brewery ceiling. Today, the narrow blow-off tube was replaced by a piece of 2″ hose, which seemed adequate to handle the CO2. Nonetheless, we spent the rest of the day watching the blow-off pail in fascination as this monster burbled and grumbled away. That is going to be some beer. Another hard day at the office. 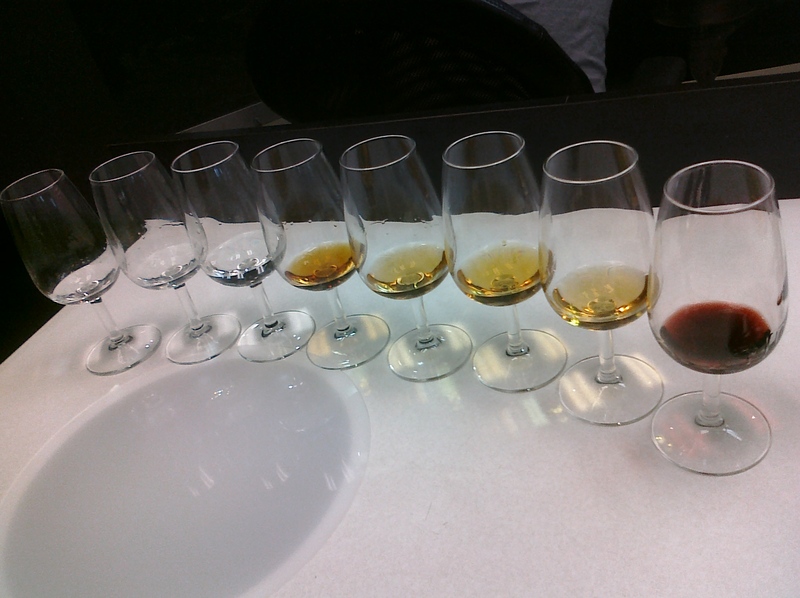 In order (L to R): grappa, tequila, gin, cognac, Canadian whiskey, Scotch whisky, Drambuie, cassis. In Sensory Evaluation, we had to smell and taste 6 spirits and 2 liqueurs. Dang! Yes indeed, we have finished the four-week segment on brewpub food, we now move on to spirits, liqueurs and wines with Jennifer Wilhelm, who has many years of experience in the restaurant trade. The definition of spirits. (A fermented and distilled liquid of at least 20% abv to which no sugar has been added.) Types of stills that produce them. Simple distillation versus continuous distillation. Clear spirits (no barrel aging and continuous distillation) versus amber products (barrel aged.) Where the flavour comes from. (Barrels, fermentables, ingredients.) An in-depth look at vodka, rum, Scotch whisky (spelled without an “e” in Scotland), bourbon whiskey (spelled with an “e” in the US), gin, tequila & mezcal, brandy, cognac, calvados, and grappa. Then it was on to liqueurs (which do have sugar added to them.). Then cocktails and mixology. Then FINALLY it was time to smell and taste a few of them: grappa, tequila, Bombay gin, Bowmore 12-year-old single malt Islay Scotch, XO cognac, and Canadian whiskey. Then it was on to the liqueurs: Drambuie, and cassis (black currant ). Jennifer encouraged us to spit after tasting. I did, since I had to drive home after class, and probably would not have been capable of finding my car, let alone driving it after 16 ounces of spirits. But strangely enough, I didn’t hear a lot of spitting from the students who live within walking–or staggering–distance. After several weeks of lead-up in History of Rock & Roll, we finally hit the era of actual rock & roll. Yep. Elvis. Buddy Holly. Little Richard. Blue Suede Shoes. Good Golly Miss Molly. Great Balls of Fire. For instance, Jerry Lee Lewis had 11 Top 100 hits (22 points); no #1 hits (0 pts); he appeared in two movies (High School Confidential and Jamboree, 4 points); had a 3-in-1 scandal (marrying his first cousin, while she was only 13, while he was still married to his previous wife, 12 points); and he did not die or face serious injury during the period (0 pts). That netted “The Killer” 38 points. Very respectable, making him one of the top stars of the era (at least by our accounting method), but it turns out that his point total–and everyone else’s–paled in comparison to Elvis, who had double the points of his nearest competitor. No wonder they called him “The King”. More presentations of newsworthy ethical dilemmas in Business Ethics. In FCF, we examined filtration in-depth. (Get it? There are two types of filters: depth filters and membrane filters. Get it? Get it? Oh, never mind…) Today’s class mainly dealt with depth filters that use diatomaceous earth (DE): vertical leaf, horizontal leaf and candle). Each one, naturally, has its pros and cons. Decide on a pitching rate (how many yeast cells per millilitre) and multiply that by the gravity of the wort. Calculate how many yeast cells you need in total by multiplying the number of cells per millilitre from Step 1 by the total volume of your wort, measured in millilitres. Calculate the volume of your yeast slurry that contains that many yeast cells. That’s a lot of slurry. Subtract the actual calcium content of the water (in mg/L) from the desired concentration to get the needed concentration to be added. Divide the needed concentration by the actual percentage of calcium in the compound to get the amount of the compound (in mg/L) to be added. Multiply this by the volume of the water to arrive at the amount of compound to be added. All of these equations and some problems are listed in our text book (A Handbook of Basic Brewing Calculations by Stephen Holle). I have a copy, but some of the other second-year students have run into a curious problem: This text arrived in the college bookstore a a couple of weeks after the semester had started, apparently just as a first year Brewmaster student was in the store. He bought one, and as I understand it, the rest of his classmates saw it and rushed to the store to buy up all the remaining copies. The bookstore is now refusing to order any more copies for second-year students who actually need the text book, since, hey, the bookstore originally ordered the correct amount for the year. Now not only will most second-year students have to order a copy from the States and hope it arrives pronto, but next year the bookstore will order enough copies for the new second-year students–and the new text books will sit on the shelf, because all the new second-year students already have one. There has got to be a better system. On to History of Beer, where we learned about the gradual changeover from monastery brewing to increased private commercialization.